Scientists have found out that ordinary potatoes cooked for about eight minutes can serve as powerful batteries (potato battery)! Professor Haim Rabinovitch (science and agriculture department) together with a team of scientists has found out that with the help of units that actually represent regular potato slices placed between zinc anode and copper cathode and linked with wire can bring light to a standard room with LED lighting for about 40 days! Potatoes are able to deliver electricity for electronic gadgets too and they are ten times cheaper than ordinary type AA batteries. We must point out that this discovery can bring many benefits to the population that lives in isolated and underdeveloped countries around the globe. According to Rabinovitch, they have used potatoes because these vegetables can be cultivated in almost any place in the world – even in areas with subtropical and tropical climate. This is the most used crop on our planet. 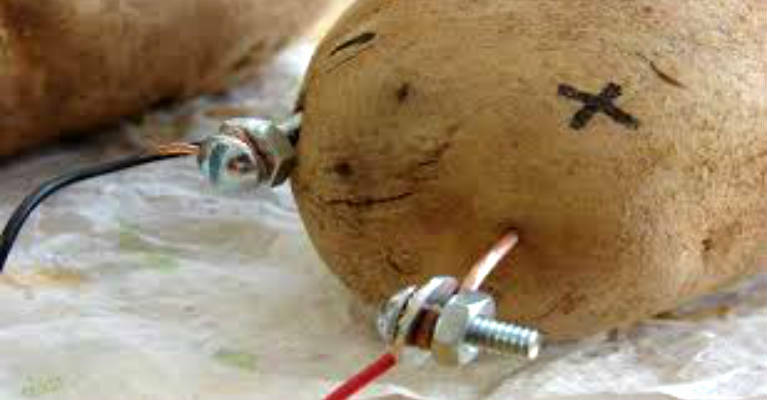 Of course, potatoes are not able to create energy, but they are an excellent conductor that connects the metallic parts, easing the movement of electrons in the wire and finally leading to electricity. In addition, potatoes were selected because they don’t lose their properties for a long period of time.